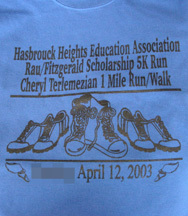 The 5th annual 5k Run and the One Mile Walk, inspired by-the memory of Hasbrouck Heights teachers John Rau, Cheryl Terlemezian, and Robert Fitzgerald, was held on April 12 with a registration beginning at 8 a.m. 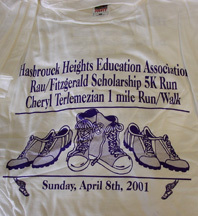 The Rau-Fitzgerald Memorial Run started at 9:30 a.m. on the Boulevard, followed by the 10:30 a.m. Terlemezian mile walk. 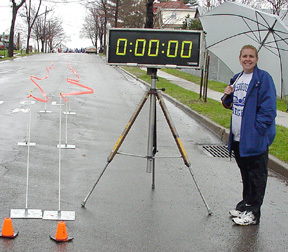 Volunteers helped direct traffic for the runners on the streets, hand out water, bananas and oranges, and register participants for run. The New Balance, Costa Memorial Home and other local businesses helped sponsor the event. The HHFD Ambulance Squad provided event support. 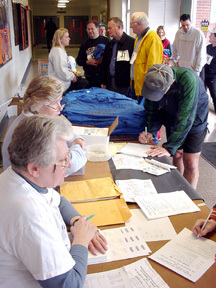 Registration began at 8 a.m.
"T" Shirts from previous runs were available. 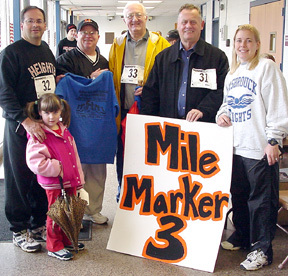 Mayor William J. Torre (with daughter Katie), Coach Nick DelCalzo, Councilmen Herbert D. Heeren and John Wassberg with Race Director Barbara Christianson. New Balance was one of the sponsors.